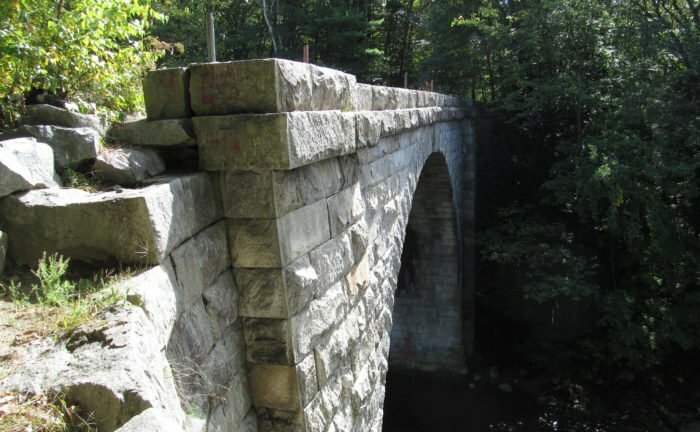 The Ohio Department of Transportation is planning to repair a 13’ X 128’ stone arch bridge on Park Avenue West, between South Park and Middle Park, by installing an arched tunnel liner and concrete knee walls to support the liner. Storm sewer repairs and catch basins will be relocated from over the top of the structure and out of the center of SR 430. The existing modern guardrail will be replaced, and minor sidewalk, curb and pavement work will be conducted as well. Minor right-of-way will need to construct the improvements. The area of potential effects (APE) features the footprint of the proposed improvements. This section of West Park Avenue was previously surveyed west to Trimble Road. As part of the City of Mansfield Comprehensve Preservation Plan and Process (B.D. Rickey & Co. August 1, 1984). The National Register of Historic places listed the John Sherman Memorial Gateway entrance columns, which are located approximately 338 feet east of the APE and flank the entrance to South Park at Brinkerhoff Avenue (NOTE – more information here). 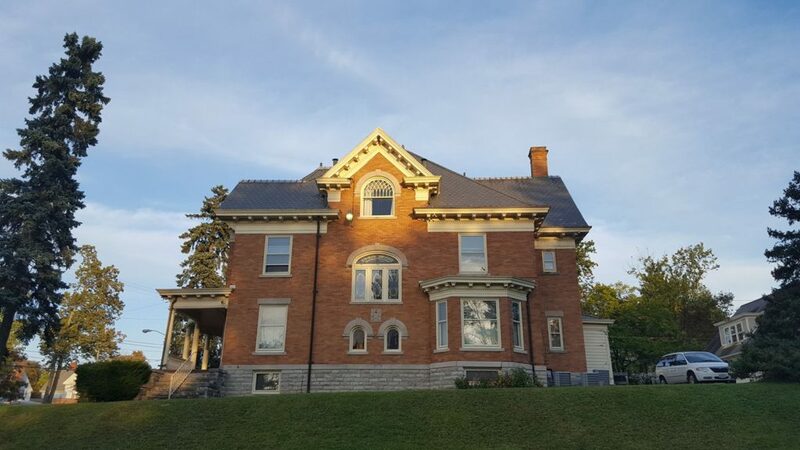 The National Register also listed the Fraser House, which is located at 681 Park Avenue West and is located 400 feet west of the APE at the southeast intersection of Park Avenue West and Brinkerhoff Avenue (NOTE – more information here). This project will not require new right-of-way from these properties and will not impacts these cultural resources. There are two sandstone columns that flank Park Drive approximately 50 feet west of the stone arch bridge. The stone columns will not be impacted by the bridge work. A Google Maps view of the bridge can be seen here. South Park was created in 1888 when senator John Sherman donated scenic farmland on the west end of town. A commission was designated to tend to city recreation lands, and within weeks they had set in motion plans to turn the wooded hills and ravines into an urban park setting: access roads were laid out on the grounds, a gully was filled on Brinkerhoff Avenue to create the broad front lawn, and a picnic pavilion was built. In August of 1892, The Weekly News called for the Park Commissioners to make a streetcar depot on Park Avenue at the Brinkerhoff entrance to the park in order to accommodate the crowds of folks visiting the park (https://www.richlandsource.com/area_history/the-rustic-footbridge-in-south park/article_c9d878d6-2999-11e5-915b-ab4727e2b57a.html, accessed February 20, 2019). Currently, the park features a relocated and refurbished 1812 blockhouse, a marker memorializing the Sultana steamboat disaster, Civil War cannons, a tribute to Johnny Appleseed, a memorial to those who served in the Ohio Volunteer Infantry during the Civil War, a pavilion, playground, corn hole games, short hiking trail and outdoor bathrooms. Based on the date of the park’s development and online photos of the interurban line established on Park Avenue West taken in 1892, the circa-1880 date for the stone arch bridge (SFN: 7006152) is accurate. The bridge was inventoried for ODOT’s 2010 Historic Bridge Inventory Update and it was determined that the structure was not eligible for the National Register of Historic Places based on modern alterations and extensions on both ends. Visibility of the 13-foot wide stone arch is obscured by concrete extensions on both ends and it has been altered by intersecting roadway drain pipes. Lining the stone arch bridge with a steel tunnel liner will essentially allow the original interior stone arch to remain in place and protect it from being undermined. The non-historic bridge will remain in ODOT’s database as a stone arch. Based on the results of records checks and scope of work, the project is of a type that has minimal potential to cause effects. No National Register-listed or eligible properties will be affected by the bridge maintenance and repair work. One lane of traffic in either direction will be maintained during construction. The construction start date is anticipated to be July 1, 2020. Written comments about the proposed project may be mailed to Don Rostofer, ODOT District 3 Environmental Coordinator, 906 Clark Avenue, Ashland OH 44805 by March 25, 2019. You can also contact ODOT by telephone at (800) 276-4188 or by email at Donald.Rostofer@dot.ohio.gov.